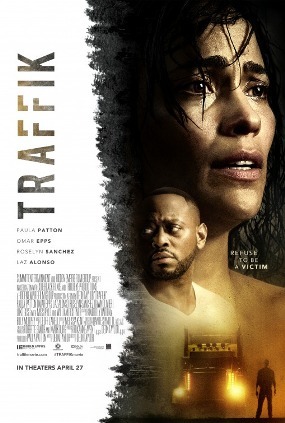 Lionsgate and Codeblack Films releases Traffik on April 20th, 2018 nationwide. NYC MOVIE GURU: How challenging was it to introduce the character of Brea to the audience with a wealth of information about her within the first 10 minutes? Deon Taylor: The introduction of her is probably the most important piece of the movie so that you can understand who she is and realize that you're going through a journey with her. What I tried to do in the beginning of the movie is invest a little bit more into her so that the audience buys into her a little more. So, automatically come in and see a woman who obviously lives alone, who's very ambitious and career-driven. She's taking care of her body and going through a lot of stuff at work while trying to figure out who she is. NYC MOVIE GURU: What was the process like to decide how to hook the audience in the opening scene? DT: I thought that you should see the central danger at the very top. I felt that you should see a world that you really don't understand and then, soon enough, you'll come back to it and figure who this guy is in the club and exactly what he's doing. A lot of audience don't know that they've already been tuned up to see this from the very opening frame of the film. NYC MOVIE GURU: Why did you decide to include the upside down credits and highway? DT: I wanted to drop the movie into a different headspace. Often times, very, very real things scare people. If you go see A Nightmare on Elm Street, Freddie Kruger is the monster. I wanted to play with all the elements around Traffik. I chose to show the world upside down at the end and the credits upside down because, ultimately, this is one story among millions. I chose to leave you with that world with the truck driver who's like a menacing beast going down the highway and you don't know what's inside the truck. I thought it was interesting to leave you with that as a filmmaker. NYC MOVIE GURU: What do you think is more powerful: horror that you see or horror that you imagine? DT: It's a very delicate line here with this movie. You have to do it tastefully, if that makes sense. During the moments that were abrupt, it's abrupt and fast, but you see nothing. I just think that the imagination is much more powerful. NYC MOVIE GURU: How challenging was it to keep the film lean at a running time of 95 minutes? Was there any temptation to add more? DT: Yes, there was. My editor, Melissa Kent, and I felt like we got it. It was a moment where I felt like if I was going to add a little bit more here, I feel like your blood pressure is the highest that it could possibly be when you're at the 90-minute mark of the film. Ultimately, when Brea comes out and I slow you down a little bit to get the score set up, I felt like that you had enough. The 95-minutes was the perfect running time for you to enjoy the movie and have a blast and be blown away when it comes on. DT: I think that this film is grounded in reality. That's what I was aiming for. I've always been a reality guy. I did a movie a few years ago called Supremacy which was more of an arthouse movie. It was done in reality. For this movie, I wanted it to have a commercial appeal and for it to be a thriller. I wanted to blend the message of trafficking with something that people would want to go see. What's interesting about it is that the reality part of it is that human trafficking is real. Here's how it looks and feels. I thought that that was a cool thing to do in the movie because there are so many moments that I could've skated over it or not let you spin in it for long, but I just wanted to give you nuances of what that felt like. It's been great to see people react to it. If you didn't see her moving in the truck and just showed her in the cave, you would'be wondered, "How did she get in there?" DT: One of the movies that I love that I kind of paid attention to was The Vanishing. What I loved about it is that it didn't play by any rules. I just love that film. It was the first movie that I watched as a kid. That movie was relentless. It didn't give you the answers and resolve that you wanted. It was a classic to me. With Traffik, I wanted to emulate that world. I don't want you to go to the movies and you see the same exact movie that you saw last weekend. That's what builds a classic. NYC MOVIE GURU: What would make for a good double feature with Traffik?